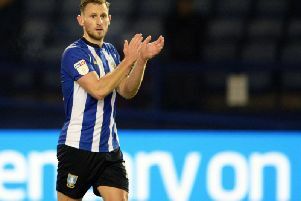 The Whites moved to second in the Championship thanks to their 1-0 win over the Owls and Sheffield United's 1-1 draw with Millwall at the weekend, taking them within touching distance of the Premier League. 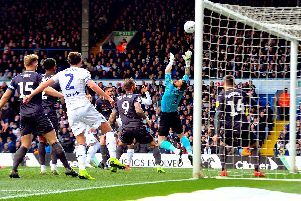 In a dominant performance from Marcelo Bielsa's men at Elland Road, Harrison's side-footed finish past Keiren Westwood was enough to wrap up a vital three points with just four games of the season to go. But it was a painful afternoon for one Leeds fan, who looks to have done some serious damage to his ankle after celebrating the on loan Manchester City star's winner. A photo circulating online shows the unlucky fan with his thumbs up apparently still enjoying the end of the match despite a grizzly looking ankle injury. The image, posted on 'Football Away Days' Twitter account has been liked over four thousand times and has attracted plenty of attention from fellow fans. @AndrewWhelan65 replied to the photo, writing: "Disgraceful sitting down at home....", while @_Hansbury96 also had a witty response: "Just a slight twist but he should be able to play on, cheers Geoff". Leeds' four remaining fixtures this season are against Wigan, Brentford, Aston Villa and Ipswich, while Wednesday's play-off hopes took a serious hit with defeat at their Yorkshire rivals. The Owls' remaining league games are against Norwich City, Bristol City, Preston North End and QPR. At least a win against Wednesday was enough to ease the pain for this unlucky fan!